On September 20, Comcast’s Brian Roberts announced that Comcast Wireless – a second iteration wireless venture – is scheduled to roll out in mid-2017. While details have been limited so far, here is what we anticipate based upon 20+ years in the wireless industry. Under their MVNO relationship, Comcast Wireless will use the Verizon’s wireless network which means Comcast will not have to invest heavily in its own cellular infrastructure. An MVNO is a Mobile Virtual Network Operator – a company that does not own the underlying wireless network, but whose focus is to resell services. In 2011, Verizon acquired AWS wireless spectrum licenses from Comcast, Time Warner, Cox Cable, and Bright House Networks. In return for the sale of the spectrum, Verizon agreed to enter into MVNO relationships with the cable companies at presumably favorable rates. This agreement allowed the cable companies to sell and bundle wireless services to their subscribers. The network will also use Comcast’s 15 million public-facing WIFI hotspots. Comcast has accomplished this by swapping out its customers’ internet routers with new versions that will double as public hotspots. 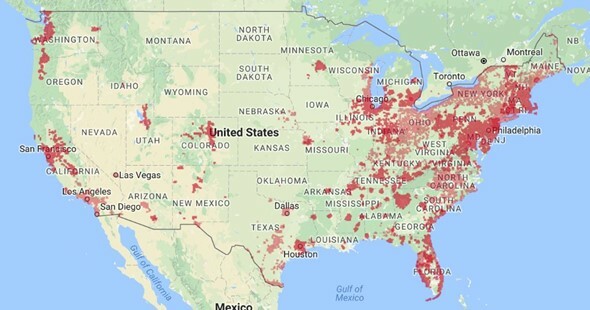 Although these hotspots can be turned off, so far only 1% of Comcast customers have actually done so. While the 100′ range of these routers isn’t ideal, it is important to remember that 80% of wireless use occurs indoors, where these routers are likely to be installed. So in essence, Comcast has created its own network of femtocells inside its subscribers’ homes and businesses, allowing these femtocells to handle the bulk of the data offloading while the consumer is home or at the office. Ting, a Toronto based MVNO, reported a 50-75% drop in data consumption rates as a result of WIFI offloading. This strategy, also known as WIFI First, will allow Comcast to dial back its use of the Verizon network. Assuming that Comcast/Verizon’s MVNO relationship is based upon minutes of use and megabytes of data used, this strategy will reduce Comcast’s payments associated with its MVNO relationship with Verizon. As compared to other MVNOs, Comcast has few advantages. Entities like Republic Wireless and Google Fi also use a WIFI First strategy, with only moderate or limited success; Google Fi’s subscriber numbers have not been confirmed but are suspected to be low, while Republic Wireless reported 300,000 subscribers in mid-2015. However, as compared to Republic Wireless or Google FI users, Comcast customers won’t need to connect to each WIFI hotspot separately because Comcast can configure the user’s phone to connect to the nearest public facing Comcast network automatically. Secondly, Comcast’s MVNO is with Verizon, the carrier with the broadest and best wireless network in the US. Third, Comcast presumably has better (read cheaper) terms with Verizon than MVNOs have with either Sprint or T-Mobile. Additionally, Comcast can bundle wireless with its other offerings at a lower price per individual service basis. Most notably, Comcast can market directly to its 28 million subscribers– 70%-80% of whom buy services in bundles. This announcement isn’t likely to have a significant impact to the public tower companies (i.e. American Tower (AMT), Crown Castle (CCI), and SBA Communications (SBAC). Prior to Verizon’s acquisition of the AWS spectrum, the tower industry was hopeful that the cable companies would use the spectrum to build out new networks. However, the cable companies’ attempts to build out networks using the spectrum have failed. Cablevision’s WIFI only service for its customers was shuttered shortly after launch- a dismal failure. Cox Cable pulled the plug on its wireless service one month prior to the sale of the spectrum to Verizon. Comcast had a few test markets for deployment of their own wireless networks which they shut down. Now, none of these cable companies will be building out wireless networks, which translates to no new collocations on towers. Furthermore, given the WIFI First strategy, Comcast Wireless subscribers will now use WIFI primarily, especially for data intensive sessions. This means that even if Comcast Wireless is successful at convincing its cable subscribers to add wireless service to their bundles, Verizon’s network is unlikely to be materially burdened by the additional use, and tower companies won’t see additional Verizon modifications as a result. To the extent that Comcast Wireless is successful, it is conceivable that there would be less data used on the Verizon network. Since the MVNO is likely predicated on a fixed price per MB of use on top of a fixed price for voice access per user, Comcast’s success at offloading data to WIFI could negatively impact Verizon. However, to the extent that Comcast is successful at capturing customers from the other Big 4 wireless carriers other than Verizon, both Comcast and Verizon are better off. Comcast Wireless 2.0 should help reduce customer churn going forward and may generate additional revenue for Comcast. By this, we suspect that Comcast is looking into the future and sees a completely wireless future and is strategically thinking about their place within that future. Accordingly, we view Comcast’s second venture into wireless as a defensive measure. It isn’t a coincidence that Comcast also announced a completely wireless cable box during this event. While other cable companies such as Centurylink have had wireless cable boxes before, we suspect that Comcast envisions that the cable box will eventually connect wirelessly to an antenna on the outside of the house or direclty to the nearest utility pole. Consumers are becoming increasingly agnostic regarding wireless connectivity, specifically as it pertains to the type of network to which they are connected. Today’s consumer doesn’t care how they connect, as long as they are “Always Best Connected.” The parity between wireless networks is increasing except in rural and low density suburban areas. Comcast wisely anticipated that some of the Big 4 wireless carriers would expand their services to include wireless broadband to the home and, in the case of AT&T and Verizon, expand into wireless video as well. T-Mobile has indicated that they are committed to wireless and will leave the “all things to all people” plans to AT&T and Verizon. Once AT&T and Verizon become capable of providing video and high speed data to the home wirelessly, consumers could conceivably have less need for Comcast’s cable and data services. Churn will increase as cord cutters switch to completely wireless plans and fixed wireless service to the home. The Big 4 could market their own bundled services similar to the way AT&T has done since acquiring DirecTV. Comcast’s WIFI strategy and its MVNO with Verizon combine to provide a competitive option, especially since throughput on Comcast’s wired broadband network will continue to outpace the Big 4 carriers’ wireless broadband services. All in all, although this wireless venture should prove more successful than Comcast’s initial wireless endeavor, it is likely to have limited impact on any company other than Comcast.